There are a lot of ways to gauge how bad the Great Recession was and how slack the recovery has been, from the stagnation of household incomes to the increase in young adults living with their parents. But perhaps no metric hits more people harder than jobs — specifically, how many were lost and how slowly they are coming back. 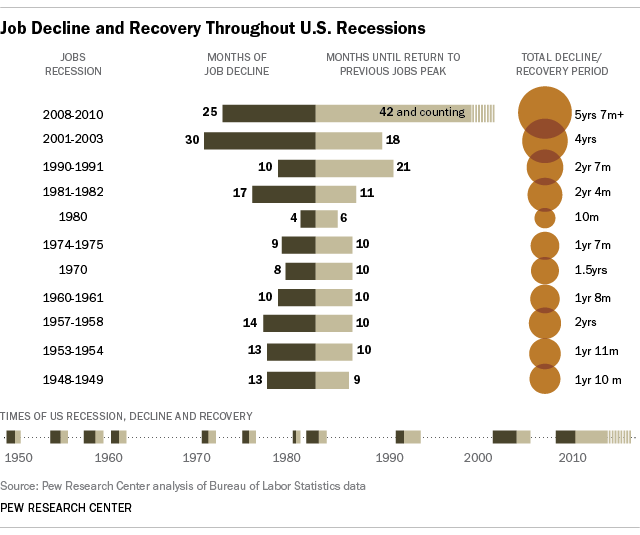 In fact, not only were more jobs wiped out in the Great Recession than any other post-World War II downturn — 8.7 million, or 6.3% of the pre-recession peak payroll — but it’s taking longer to regain them than it did in the previous two post-recession recoveries combined. The result: From the late 1940s until the early 1990s, the U.S. ec0nomy never took more than a year to regain all the jobs lost during downturns. The 1990-91 recession was fairly mild — only 1.6 million jobs lost, or 1.5% of peak payroll employment — but it took 21 months to recover them all. That was the first, though not the last, “jobless recovery“: In the aftermath of the dot-com bubble, 2.7 million jobs evaporated; it took 18 months after payrolls bottomed out for them all to come back. But even that performance would look strong compared to the current pace of job creation. Payrolls peaked in January 2008 and bottomed out in February 2010; in the 42 months since then only 6.8 million jobs have been created, 78% of those lost. And this may be the new normal, concluded a major study by economists from UC-Berkeley and the University of Texas on what they termed “The Puzzle of Rising U.S. Unemployment Persistence.” After examining a wide range of demographic factors, policy changes, economic trends and cultural shifts, the researchers still couldn’t explain why the U.S. economy appears to have lost its ability to snap back from recessions.